Top left: original mesh. Top right: mesh with SPR. Bottom row shows the subsurfed versions. Getting a bit closer with SPR, image at right shows my first successful test on “real” input. There’s still more optimization work needed to make this practical (even this small input sample takes about five seconds to finish calculating), but that’s for tomorrow (been up all night, now 7am here), so time for some sleep… but nice to have an actual result. I have seen your recent hard work on sculpt in Blender. Will you implement this SPR to dynamic topology sculpting or will you abandon dynamic topology sculpting branch and start from scratch (mean start from this SPR) ? SPR is probably too slow for real-time sculpting (unless I can get it to work significantly faster.) 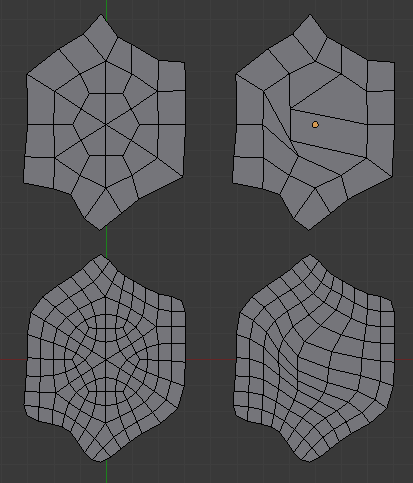 Still, dynamic topology sculpting (or something like it) needs to happen at some point. looks great but what is the purpose of it, sculpting or retopology? any progress? A bit of both. 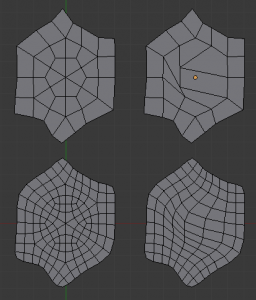 I’ll be writing more about the topology stuff soon; for now I’m focused again on dynamic topology for sculpt rather than offline methods like SPR.